Following on from my news post about Origins' new tote earlier this week, I thought it would be a nice idea to review one of their products. 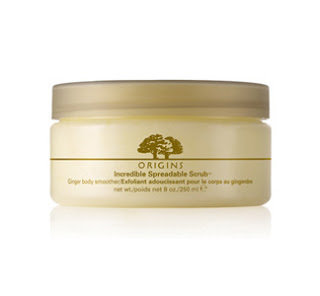 Step forward: Incredible Spreadable Scrub. Firstly, I have to comment on the packaging and commend Origins on producing this in both tub and tube formats. I really liked the butter-like texture of this. The granules of salt make it a satisfyingly rough scrub. It's effective but the Macadamia, Soybean, Kukui Nut and Sweet Almond oils in the formula prevent it from feeling harsh. The scent is warm & spicy but not overwhelmingly so and has a hint of citrus, perfect for this time of year. It lingered delicately on my skin afterwards. It's easy to see why the Origins Ginger range, which this is part of, is so loved. I really liked that the oils penetrated my skin so that it felt wonderfully nourished. I didn't need to apply any moisturiser afterwards, making this a great time saver. At £22 for 250ml, it's at the pricer end of the scale, however, a little goes a long way.